Following is the error log which says SkyDrive requires an uninstall. Even after uninstalling Skydrive explicitly the problem persists. Following Support Article helped resolving the issue. Article talks about “MS CRM for Outlook” installation. However, this applies to MS CRM installation also. We just need to remove registry keys mentioned under the specified registry hive. This resolves the problem. 2. 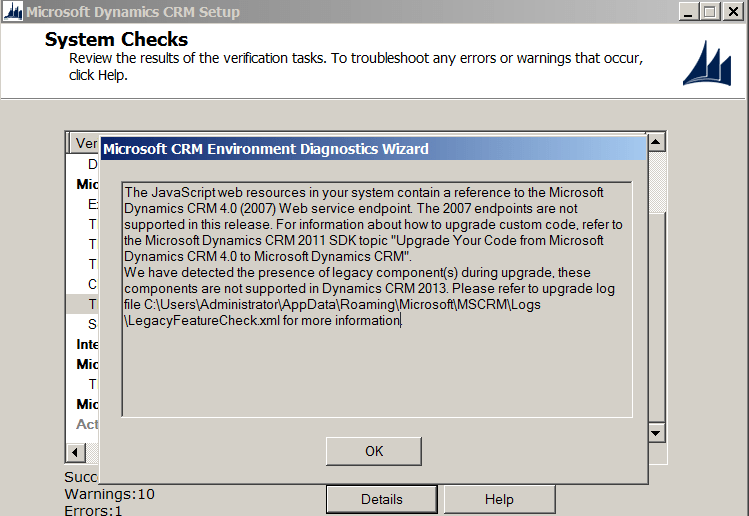 Setup System check fails as the selected CRM 2011 organization for upgrade is using CRM 4.0 end points in web resources. We need to upgrade legacy code first in order to do the installation. So, it looks like Microsoft made it mandatory for the code upgrade from unsupported code(may be not every unsupported code). As it is a test server(Lazy enough to find an excuse), I have opted a Vanilla CRM Organization for the upgrade.